Steps To Beach | Pool | AC | Sleeps 6 | Perfect Location | Special $225! Shaded by a glorious banyan tree, this home feels like an elegantly decorated tree house only steps away from the ocean. 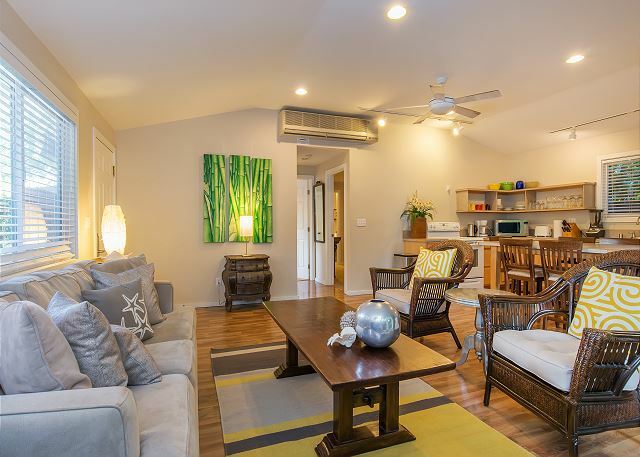 Decorated in a stylish Hawaiian style, this unit offers two bedrooms, 2 bathrooms, a full kitchen and a spacious living room area. The water in front of the home is shallow and calm, which is good for children. 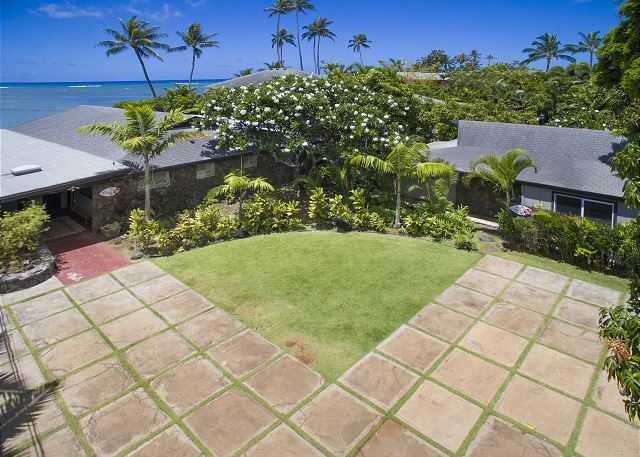 Surfing is possible during the summer months in front of the home if you walk out past the reef where it gets deeper. This home also has access to a large gated pool area that is shared with a few of your neighboring homes on the estate. Amazing snorkeling is just a few minutes up the road at world famous Hanauma Bay. 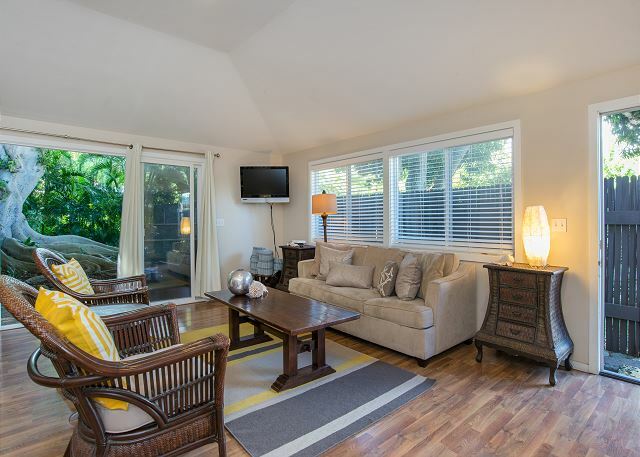 It is ideally located, permitting access to Waikiki and all it has to offer, while living in a tranquil Hawaiian home. 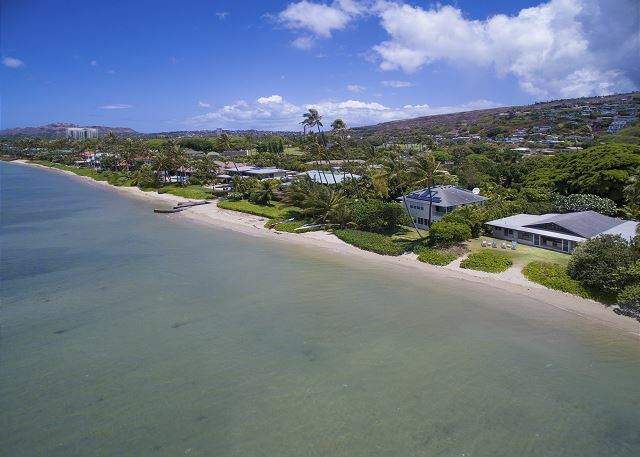 Conveniently located about 10 minutes outside of Waikiki, 5 minutes from Kahala Mall and 10 minutes to Hanauma Bay. Other: Queen size sleeper sofa. Pack n plays, cribs and kids beds can be rented and delivered. No hot tub on property. AC in bedrooms only. Fans throughout home. Generally, the experience was good. It would have been nice to have instructions for the coffee maker, the microwave labels were worn off and the toilet in the guest bath needs repairs. Access to the property is somewhat difficult due to the traffic. 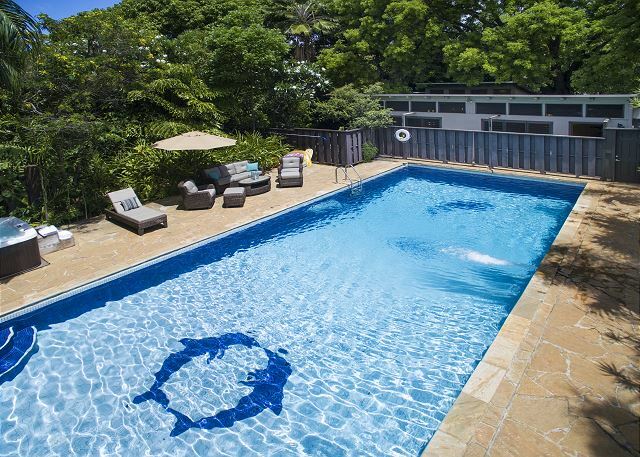 The pool was nice and the location was generally convenient. Manager Response: Thank you for taking the time to leave a review! The toilet handle has been fixed, and we will label the microwave or purchase a new one, our apologies for the inconvenience. For future guests please note that if you wait in the driveway until the nearby stoplight turns red you can then easily pull into any lane. You can't beat the location, and this house accommodated our group of 23 quite comfortably. The rental company was very responsive throughout the rental process. 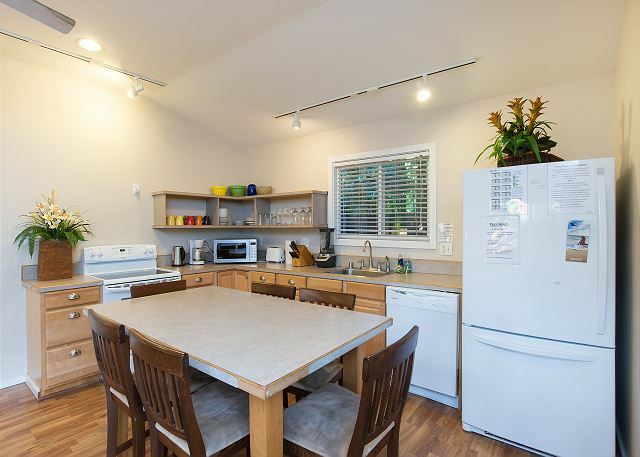 We did have a few issues - we never received the right check in information, there was someone in one of the cottages when we checked in due to a scheduling mixup, some plumbing issues and bugs, but all were addressed and rectified quickly. The house is very spacious with an open great room, large island, and huge kitchen table for gathering. Kids loved the pool table. The ocean is very shallow making it good for small children. The backyard and beach are gorgeous. The pool was very nice but not heated so only the kids would brave it. 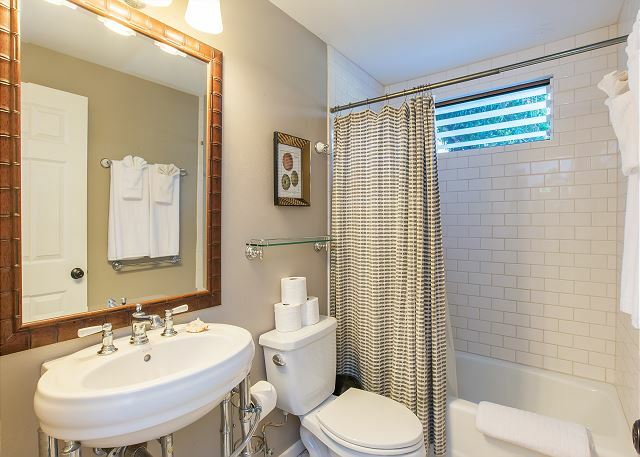 The house itself needs a good update, especially the bathroom in the main house. It also needs better bug prevention, we saw a lot of large critters. House was a little dusty, like it had been cleaned but maybe some time had passed. Overall though it met our needs. The location is stellar, very close to everything we wanted to see, but getting in and out of the house is a little tricky. Only one car can pull off the highway up to the gate at a time, and the lights take a long time to change, allowing you to pull out onto the highway. Allow an extra 10 minutes for any trip towards Honolulu for this. Manager Response: Thank you for staying with us, Herron Family! We apologize for the initial issues, and are happy that you enjoyed yourselves so much once everything was rectified. Future guests should please note that the house is serviced by Terminex monthly and we share tips in our move in instructions on how to store food properly in order to minimize and issues. We also give tips on navigating traffic. The house is scheduled for its quarterly spring clean, and is cleaned by a professional company after every booking. Please don't hesitate to call or email us with questions! My friends and I had a wonderful experience overall. The estate, with its various houses was perfect for our group. Our only issue was on Saturday when our entire group was hanging at the house swimming. At the same time, the maintenance crew was there with a very loud and obnoxious leaf blower. Given that there was a large group scheduled to be there and it was a Saturday afternoon, this was a very inappropriate time to be using a loud leaf blower. Furthermore, the man with the leaf blower paid absolutely no attention to us as he used the leaf blower in the pool area while we were all literally sitting in his path. When we asked him to please stop, he totally ignored us. This was not a deal breaker by any means and was our only issue. Everything else was great. I just hope they take the scheduling of these obviously important maintenance tasks into consideration when scheduling in the future. 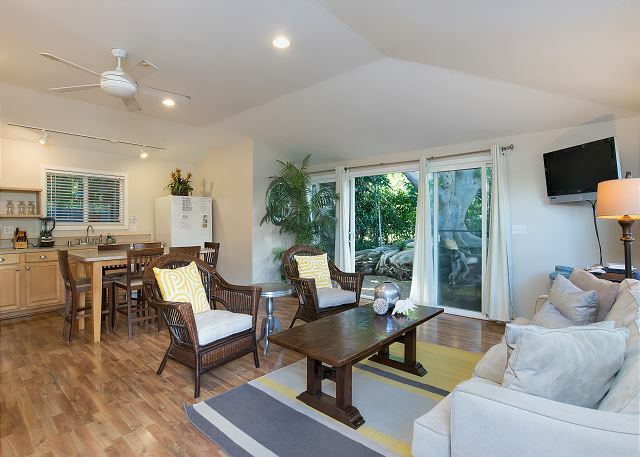 The people at Hawaii Beach homes were very easy to work with to set up the rental. The house was nice overall although very hot in the afternoons (no ac in mainlining area) even with the fans on. Plenty of space for our team of 22 and helped save a lot of money on taking the team out for dinner. We would stay again. It’s a beautiful home. 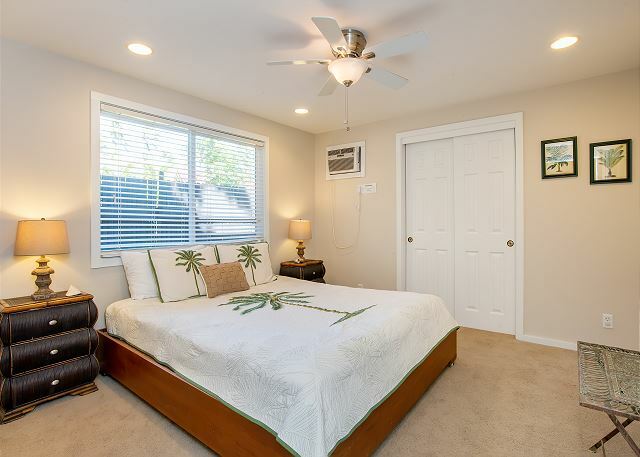 Very comfortable and walking distance from the water as well as the pool. Every home has it’s own backyard and it’s very beautiful. Hawaii beach homes customer service was not very helpful when double booking and giving us less than a week to find somewhere else to stay when shortening ours. Other than that its 5 stars! More beautiful than the pictures! We rented all four houses on this property for guests at our destination wedding and we could not have been happier with the place. It was so beautiful, there was plenty of room for everyone (22 of us total) and everyone really enjoyed the beach right on the property and the gorgeous pool that felt like it was in a jungle with beautiful tall trees and tropical plants everywhere. The houses were so comfortable too and perfect for a group getaway. Mahalo to Hawaiian Beach Homes for a perfect vacation! The E. Garden Cottage was nicely setup and a great location to boot. As stated in the Banyan Estate review and all other estate property reviews some TLC could be used for this building. The dishwasher was not working, no coffee maker and mold in the tubs. Our family of 3 stayed in the Garden Cottage for 4-nights in March and we were very happy with the property. The layout of the unit is open, we had plenty of room and it was easy to stay organized. It was also great to have our own patio, access to a shared pool/hot tub and only be a few steps away from the beach. We enjoyed being outside of Waikiki, but still close to attractions, restaurants, and shopping. For us, it was the perfect combination. We had a private space, but could still socialize with the neighbors at the pool. In fact, we only spent the first half of our vacation here and we'd wished we'd stayed more nights. The only cons: the property is off of a very busy street and you can hear some traffic noise. Also, the kitchen was a little lacking (it could use some better cooking pans/skillets and more silverware). That said, we'd still recommend the cottage and we'd stay here again. 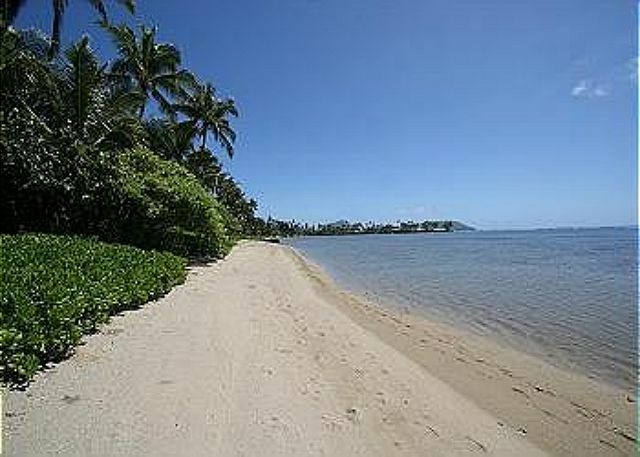 The property is managed by Hawaii Beach Homes and they were very accommodating. They provided us with a mobile app to assist with an easy check-in and check-out. Nice inside. No view but a close walk to the beach. The 4 of us could have used another chair or two to sit in the living room and visit and watch TV. The couch could be replaced. We saved a ton of money fixing our own breakfast and a dinner or two.